These charts are base on the official data released by the U.S. Census on Wednesday May 10th, 2017. The Results are on a State-by-state turnout, Population, Latino Turnout, Eligible Voting Population and Voter Registration. You can click on chart to enlarge, or you can view and download as PDF file. Total vote in the U.S. was 137,537,000. By race/ethnicity: (white 111,187,000) (Hispanic 12,682,000) (Black 17, 119,000) (Asian 5,043,000). 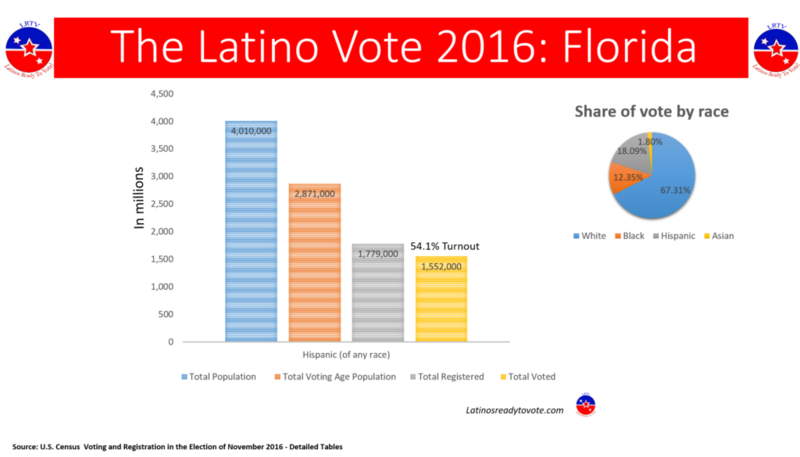 the Latino vote increased by 1.5 million but turnout relative to all Latinos eligible to vote was only 47.6%. 2. Texas slightly moved up to 40.5% turnout from 38% turnout in 2012 among Latinos. Texas increases it turnout by 42,000 to 1,938,000 in 2016 from 2012 when only 1,898,000 Hispanics in Texas voted. 3. What is notably in California is the shirking of black vote and the rapid increase of Asian vote. As share of the total vote, the Asian vote increased from 10% in 2012 to 12.9% in 2016. The “white” vote decreased from 58% in 2012 to 56.6%. Latino vote also decreased as share of total vote in 2012 when it 24% in 2012 to 23.5 % in 2016. Among Latinos, voter turnout in 2012 was 48% but it did increase by 190,000. A Dismal increase, but better than Texas where it only increased by 42,000. 4. While there was an increase of 200,000 new voters (1,552,000 in 2016 from 1,399,000 in 2012) there was also a drop in turnout from 62% in 2012 to 54% in 2016. And thought the voting age population, as share of state vote, is smaller than in CA and TX, the fact the FL remains swing with 29 Electoral votes makes FL still a hot state when it comes to presidential cycles. As you know. Florida is going through demographics and generational changes among Hispanic groups with American-born Cubans shifting away from GOP while the older generation of Cubans who immigrated in the 60s is shirking. 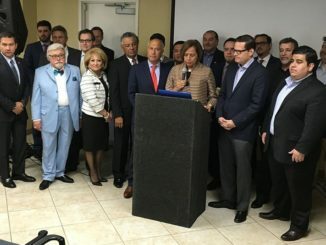 Puerto Ricans now outnumber Cubans and a mix of South Americans and Mexicans in south Florida are breaking the monopoly the Cubans used to have, and thus, why Ileana Ros-Lehtine has decided not to run for re-election. Trump got 35% of the Latino vote, but exit polls show that he got 50% among Cubans. But, this is still a drop from 2012 when Romney got 40% in FL among Latinos. 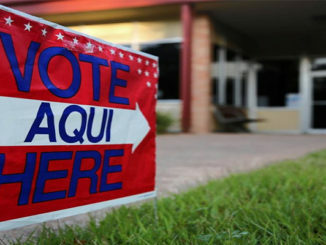 In AZ, in 2012 400,000 Hispanics voted, or only 40% of all Latinos eligible to vote in the state. In 2016, 543,000 voted turnout was 47.4% and 143,000 more Hispanics voted. 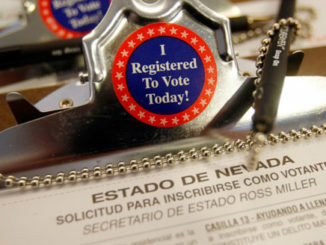 In 2012, 516,000 Hispanics were registered to vote. In Nov 2016, it increased to 654,000. Trump won AZ by only 5 points, but McCain won by 17% points among Hispanics, and Clinton won 61%-31%according to exit polls. The increase of Latino vote in AZ is very positive. When SB1070 passed and was signed, the share of the Latino vote was only 11% (it was the same percentage in CA when 187 passed). Now it’s almost 20%. Arizona got 3.5 times more new Hispanic voters in 2016 than Texas despite the fact that Texas has almost 4 times more Hispanics that can vote. 5. New Mexico also saw a drop of the Latino vote. It dropped from 306,000 in 2012 to 276,000 in 2012. Turnout dropped from 56% if 2012 to 48.2% in 2016. This is the opposite of TX, CA and FL that saw an increase. New Mexico is the only state in the southwest that has lost population in the last 6 years and education levels have decreased despite that fact that Gov. Martinez as made education a top priority. 6. Hispanic turnout in Nevada increased to 56.7% in 2016 from 52% in 2012. In 2012, 157,000 Hispanic voted, in 2016 that number increased to 196,000. Trump lost NV by 2.5 points. 7. Colorado also saw a drop in Latino vote. 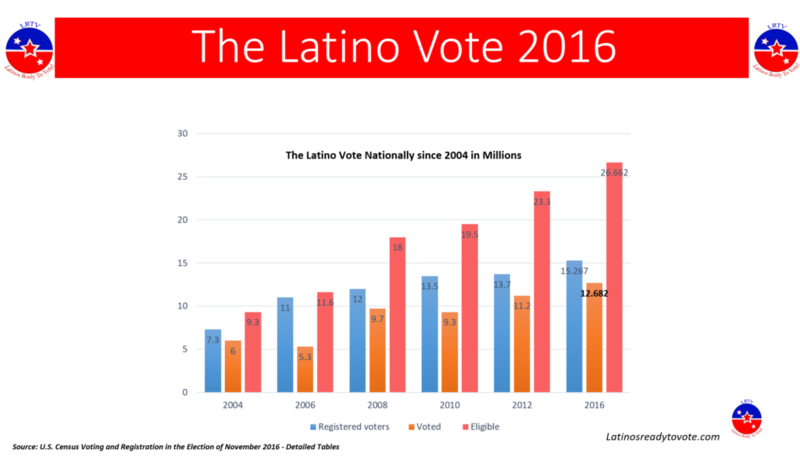 In 2012, 2590,000 Latinos voted but in 2016, that number drop to 237,000. 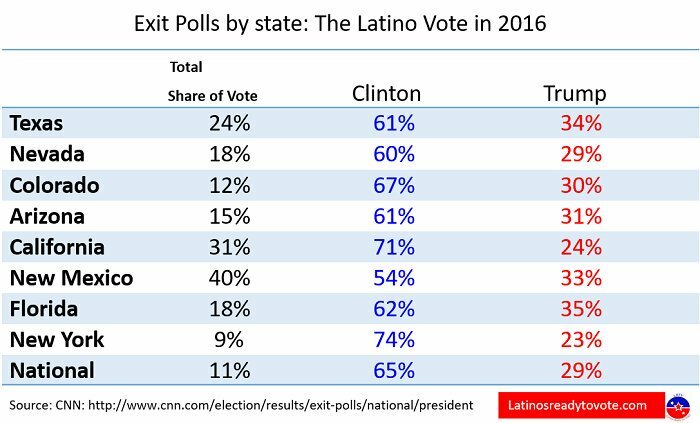 But Clinton won Colorado 67%-30% among Latinos according to exit polls. Here is another chart you might want to keep in consideration when reading the charts. You can also read the 2012 charts .